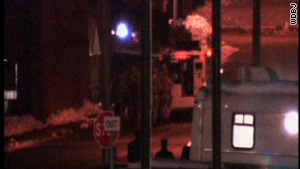 The nearly nine-hour hostage standoff ended late Wednesday night in Wytheville, Virginia. 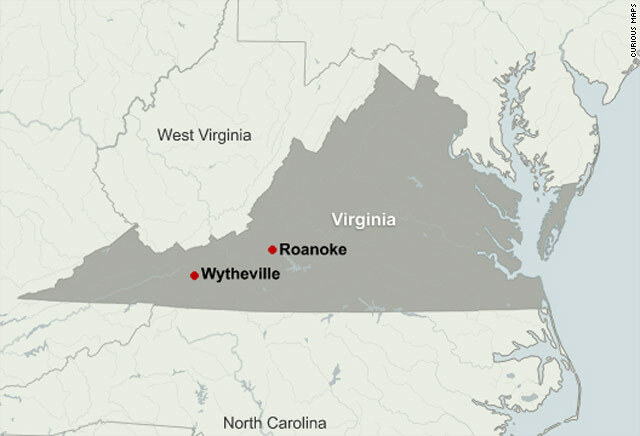 (CNN) -- A daylong hostage standoff ended late Wednesday when an armed, disabled man wheeled himself out of a post office in Wytheville, Virginia, and was taken into custody, police said. The alleged gunman, identified by police as Warren "Gator" Taylor, 53, of Sullivan County, Tennessee, surrendered in a wheelchair, said Wythe County Sherrif's Office Chief Deputy Keith Dunagan. All three hostages walked out without injury. Wytheville Mayor Trent Crewe breathed a sigh of relief when the almost nine-hour ordeal finally ended. "All of them are all right, thank God," Crewe said. "I am elated that it's over." Negotiators from the FBI and the Virginia State Police negotiated the suspect's surrender and the release of the hostages, said a law enforcement source familiar with the situation. Taylor entered the Wytheville post office at about 2:30 p.m., pushing a wheelchair with a black duffle bag on the seat. Taylor is missing a leg and wears a prosthetic, Dunagan said. Inside, he fired a gun, according to police. An unidentified witness told CNN affiliate WDBJ that he, a fellow window clerk and the postmaster were in the building when the gunman entered, but they quickly fled. He added that his supervisor was one of the hostages. One hostage, Jim Oliver Jr. of Wytheville, called his mother, Sandi, WDBJ reported. She said he sounded "tired and exhausted." He asked for a pizza but made no other demands, Dunagan said. He seemed neither angry nor disgruntled but did utter complaints about government and taxes, Dunagan said. When the supreme pizza that police ordered was more than half an hour late, Taylor joked that Pizza Hut promises delivery in less than half an hour or the food is free, Dunagan said. There were reports that Taylor, who is believed to have a military record, had a "device," and it appeared that his car, parked outside the office, was equipped with some type of device as well, Crewe said. He did not elaborate on what the device could be. "The police authorities have told me they are acting on the assumption there is an explosive device of some kind in some location," Crewe said earlier in the day. "There is a bomb squad, in fact more than one bomb squad on site, but we cannot confirm any explosives." The surrounding area of downtown Wytheville was evacuated within a three-to four-block radius, Crewe said. Wytheville is a small town, population just over 8,000, in southwestern Virginia, tucked in the foothills of the Blue Ridge Mountains. CNN's Shawn Nottingham, Mike Brooks and Moni Basu contributed to this report.